When it comes to selecting an appropriate paper shredding company to look after your document destruction needs, it’s crucial to consider the provider’s background credentials. How long have they been in the paper shredding industry? Are they associated with key groups or organizations that are relevant to their services? Most importantly, are they a NAID certified shredding company? 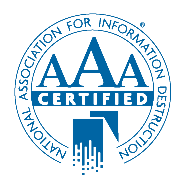 What does NAID certified shredding mean? What is NAID and what does it represent? 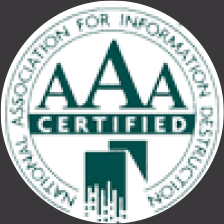 NAID is the international trade association for the information destruction industry. NAID’s purpose is to help and promote the highest standards of ethics for the document destruction industry, through partnering with its members and lawmakers to ensure that happens. What does a NAID Certified Shredding Company Promise to its Customers? Why does NAID Certified Shredding Matter for Your Security?